Born for Love is the definitive book on empathy. Renowned psychiatrist Bruce Perry has appeared on Oprah, CNN, National Public Radio’s All Things Considered, and other programs as an expert in this hot area of neuroscience, and has been cited as such in Newsweek, the New York Times, and The New Yorker (in a story written by Malcolm Gladwell). 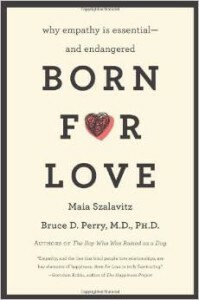 He and co-writer Maia Szalavitz explore empathy’s startling importance in human evolution and its significance for our children and our society. The authors of The Boy Who was Raised as a Dog present a powerful case that love is essential…and endangered.